Brian accepted a $85M, 5 year deal with the Yankees this weekend. That's hard to stomach for me as a fan, since like every good American baseball fan, I think the Yankees are scum. Still, it's better than him ending up on an NL team like the Phillies or Cubs that we have to play every year. 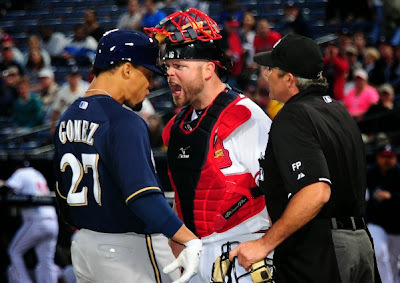 Like Tim Hudson, Brian McCann spent 9 years with the Braves, and for many fans who started watching the game near the beginning of the millenium, he's likely the only catcher they associate with the team. He's been a mainstay behind the plate for nearly a decade, and in that time he amassed an impressive amount of slugging stats. Brian had 176 homers, 227 doubles, 2 triples (I assume somebody fell down in the outfield on those), 661 RBIs, over 1000 hits, an average of .277 and an OPS of .823 for his Atlanta career. He was an all-star 7 times during that tenure, and he won the Silver Slugger 5 times. In short, he's one of the best catchers if not the most decorated catcher that the Braves have ever had on the team. Relax Javy Lopez fans, he's right there on the list too. Brian will have the unique distinction of winning a division on the front and back end of his career in Atlanta, with a gap of none in between. During that time, the Braves were mostly a rebuilding effort while the Phillies dominated the NL East. As they approached the 2010 year, the Braves finally made it back to the playoffs for the first time since 2005. However, they lost to the Giants who eventually won the World Series. From that point on, Brian's numbers began to take a dive. There were questions whether the Braves would bring him back in 2013 on his $12M option. But they did, and his 2013 season was marked better than 2012, one of the worst statistical seasons of his career. Brian hit .230 in 2012 with only 20 homers in 439 ABs, but in 2013 even coming off injury for a month, he hit .256 with 20 homers in just 356 ABs. I'm sorry to see Brian go because of what he's meant to the Braves both on the field and in the clubhouse. However, I was one of those people who questioned bringing him back in 2013 in the first place due to his age and production. Brian will be 30 when this contract takes place until he's 35. From a straight numbers standpoint, catchers begin to lose their ability to hit in their 30s due to all the wear and tear. While that's a problem for an NL team, an AL team like the Yankees could move Brian to DH when he's no longer able to be an everyday battery guy. I think the Yankees are taking a risk with Brian since he's had injury problems and hasn't posted an OPS over .800 since 2011. However, they are the Yankees and they can afford to overpay people with their giant payroll. I think we all want to wish Brian good luck in NY, but I can honestly say I won't root for the Yankees if it comes down to them in the world series just because Brian is on the team. It's the Yankees. I can't do it. I won't do it. Still, I hope Brian hits like 40 homers and gives those fans in NY a good show before they get drummed out of the playoffs like the overspending bunch of cheaters they are. Oh and Brian? Punch A-Rod in the face for us when you get the chance, buddy. What Happens to Turner Field?